"Man born of woman cannot outrun his fate. Better then not to question the Immortals, nor when they have spoken to grieve one's heart in vain. A bound is set to our knowing, and wisdom is not to search beyond it." Every society has rules. There's usually quite a lot of similarity on the major points: no murder, no stealing, that kind of thing, but outside of that there's a lot of variation. Making sure everyone knows and understands and (for the most part) plays by those rules is one of the most important roles a society has. We can learn a lot about a place by learning about their rules: what they chose to forbid or allow and how they enforce it. 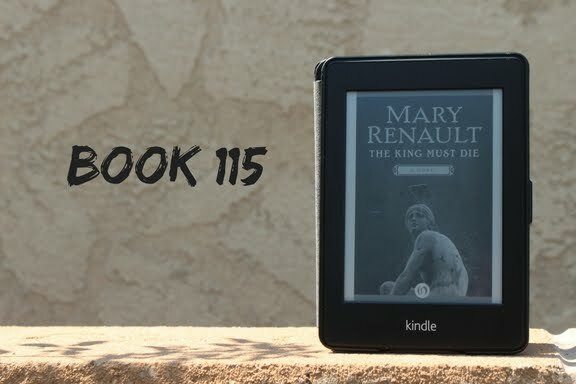 Mary Renault's The King Must Die takes place in a world where the rules are in flux. We're in Ancient Greece, and a matriarchal society with an earth-based religion is in the process of changing to a patriarchal one that worships sky gods. She uses this background to re-tell the Greek myth of Theseus. Briefly-ish, the myth version goes as such: King Minos of Crete angered Poseidon by refusing to sacrifice a particular bull. To punish him, his queen, Pasiphae, is made to be overwhelmed by lust for that bull. She engages Daedelus, the legendary craftsman, to build a cow she can fit inside to, er, consumate her love. What results is a half-bull half-man monster that eats human flesh: the Minotaur. Daedalus is commissioned again, to build a maze, the Labyrinth, in which the beast can be hidden. Crete is a powerful city-state and demands tribute from other Greeks: seven young men and seven young women to be given to the Minotaur every year. Theseus is the son of the King of Athens, and is one of the youths sent to Crete. When he arrives, Minos' daughter, Ariadne, falls wildly in love with him and gives him a ball of yarn that he can tie near the entrance of the maze so he can find his way back out. She also gives him a sword, which he uses to kill the Minotaur. He flees with Ariadne, but abandons her on an island on his way back home. Theseus forgets to change the color of his sails when arriving back in Athens to signal his father that he's returning home safely, and his father commits suicide in despair over his "death". There's more, but that's the portion covered in this book. Renault takes that structure and constructs a story that could have been the basis for the myth. In her tale, Theseus is raised by his mother, a priestess devoted to the earth goddess, and her family outside of Athens. As a teenager, he starts to return to Athens to be reunited with his father, who nearly kills him accidentally. He does volunteer to be sent to Crete, but for different reasons: in this version of the story, based on something more like actual history, the young people are sent to Crete to become "bull dancers", a team-based sort of sacred ritual bullfight. The labyrinth is the enormous palace of Minos, Ariadne is a priestess. Although the Olympians are mostly taken out, Theseus is gifted with an ability to sense pending earthquakes, kind of big deal in a seismically active region. Reading this book actually reminded me a lot of my slog through The Masks of God by Joseph Campbell, a series which details the development of religions all over the world. Campbell traces the same transition in Western religious belief that Renault highlights, with earlier people just starting to form groups based around farming often believing in an earth goddess, who required human sacrifice in order to produce agricultural bounty, while later societies with more stratification turned to worship mostly-male sky gods. Renault portrays a Greece which is dealing with this exact movement, with Theseus himself working to convert a city where he finds himself from the latter to the former. The story is entertaining enough and Renault's prose is solid, but Theseus is a bit of a Mary Sue. He always has the right answers, for the right reasons (in his mind anyways), always does the correct thing. It made him kind of boring as a character...I wanted him to face more conflict from within, struggle against forces internal as well as external. Theseus is motivated strongly by devotion to his religious beliefs, especially his sense of moira, or fate. This got to me thinking about the role of religion in public life. In Theseus' world, religion is a constantly part of daily life, both inside and outside the home. Today's Western world, on the other hand, is becoming progressively less and less religious. This is often treated as a reason for some sort of moral decline, which I find obnoxious as a non-religious but perfectly moral person. But it does have me wondering about something else that comes up often in The Masks of God: ritual, and its purpose of enforcing social structure and rules. We have some secular rites of passage: drivers licenses, high school graduation, college graduation, but these lack the solemnity of religious ceremonies. I certainly don't think that secular culture is incapable of creating meaningful rites to acknowledge maturation, but I don't think it's necessarily done so effectively yet. Anyways, to close out with the book itself: it's a decent read, but not a can't miss, and I don't feel any compulsion to seek out the sequel. Tell me, blog friends...do you think our cultural markers of maturity are as significant as they could be?